Earlier this year and in partnership with our friends at Jaffe, The Managing Partner Forum conducted the most comprehensive survey to date of law firm managing partners about social media. More than 120 firm leaders participated, mostly from smaller and mid-size U.S. law firms. We broke the survey into two parts. In Part 1, published in September, we asked law firm leaders about their personal use of and attitudes about social media. In Part 2, published earlier this month, we asked them to share how their firms were adapting to the social media phenomenon in terms of policy and training. Unfortunately (but not surprisingly), we learned that, in fact, smaller and mid-size firms are way behind BigLaw in this important and rapidly growing area. Now is the time for law firms to get with the program and step up their online presence. It’s not that hard. Here are a few tips to get you started. We’ve all heard stories about lawyers doing dumb things on the Internet. And it’s dangerous to assume that folks at your firm are immune from momentary lapses of judgment. According to the 2014 State of Digital and Content Marketing Survey, published by ALM Legal Intelligence and others, 84 percent of the AmLaw 200/NLJ 250 firms have social media policies in place. Yet, just 38 percent of smaller and mid-size firms have such policies. 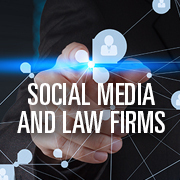 Avoid potential problems by putting a social media policy in place at your firm today. Need a template to get you started? Click here to download one. Another smart thing to do (if your firm is not already doing it) is to provide ongoing social media training for your people. Eighty-one percent of BigLaw does it and you know darn well they’re not into wasting their people’s time with non-billable stuff. Only half that percentage of smaller and mid-size firms provides this type of training. If your firm is on a budget or does not have an in-house marketing person, Stefanie Knapp, Online Marketing Specialist of Allen Matkins in Irvine, Calif., suggests that you look to your local community college to find a qualified individual to come into your firm to do the job. LinkedIn has clearly emerged as the place where professionals mix and mingle online, so be sure that your training program covers it in a fair amount of detail. By now, every lawyer in private practice should have a LinkedIn profile. Fifty-nine percent of law firm leaders in our survey report that their firms have a LinkedIn page. But research reveals that there’s plenty of room for improvement. Many LinkedIn pages we visited lack meaningful content and do not appear to be maintained on a regular basis. With just a little effort, LinkedIn can give your law firm a strong online presence and make you look bigger and better than your competitors. Want to see an example? Click here to take a look at what the MPF has done on LinkedIn … and I’m a one-man show! In conclusion, you want your firm, its lawyers and your staff to be found online. You want them to look qualified and capable. And it’s easier than you might think. If I can do it, so can you. Go for it, and be prepared for some big results. John Remsen, Jr. is President of TheRemsenGroup, a strategic planning and marketing consulting firm that works exclusively with law firms to help them attract and retain the clients they want. He is also President and CEO of The Managing Partner Forum, which presents the premiere leadership conference for law firm managing partners. He can be reached at 404.885.9100 or JRemsen@TheRemsenGroup.com. Social media is one of the best tools for all marketers who want to grow their business worldwide. Thanks for these articles which explain all about professionalism. Now days people are interested in online business which gives us exploration for growing in the industry.